In late April, five Occupy Wall Street (OWS) teenagers from Cleveland were arrested and charged with conspiracy to commit terrorism. An FBI agent had originally urged them to “blow up the headquarters of some Nazi or the Ku Klux Klan.” Instead, he framed the group for a plot to destroy a Cleveland bridge, marking the first known instance that the tactics used by the FBI to suppress Islamic and white-oriented political dissidents have been used against the OWS movement. The phony, federally concocted terror conspiracy was immediately used by the city of Cleveland to revoke the permit under which the Occupy movement there had been operating. This announcement was then carried by newspapers across the country as evidence of the “danger” of the OWS threat. 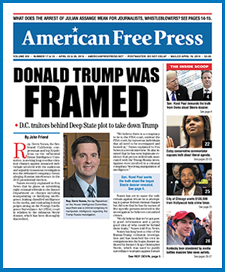 Yet the script that the federal agents who made the arrests were reading from was a tired and old one, which AMERICAN FREE PRESS has been exposing for the past year, and which has even recently drawn the attention of establishment newspapers such as The New York Times. In this most recent case, a federal informant was sent into an OWS encampment to try to recruit angry, foolish or mentally disturbed individuals and get them to agree to commit crimes. The informant happened upon a group of young anarchists, whose anger at what they viewed as the “racist capitalist patriarchy” he transformed into a “terrorist” plot involving fake bombs provided by the government—in this case, persuading the youth that the bombs, provided by the informant, could be detonated through the use of text messages sent by cell phone. The inability of the government to recover from the economic collapse it and its Wall Street allies created in 2008 has caused the Obama regime to become increasingly desperate in its efforts to maintain control and distract the public from real problems, which it is unable to address. The Obama regime used a similar tactic near the end of 2011 to justify the imposition of sanctions on Iran. This scheme is being used to distract the public with a phony threat of war and is also used to discredit left and right-wing political activists who have raised questions and garnered public support in opposition to the regime’s agenda. Traditional opponents of the Obama regime in the neocon movement of course hailed the arrests in an effort to persuade their readers that OWS is more of a threat to the ordinary American than the phony “war on terrorism” being instigated by the FBI. It’s all part of a plan to position people on both sides of a debate so they can frame and control it, and distract the people into cheerleading for one team or the other while both teams, knowingly or unknowingly, work toward the same goal—in this case, the goal of a world dictatorship.